"D'ya have t'poop, baby? Can y'poop in the water?" 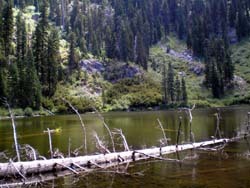 An easy half mile stroll inside the boundary of the Red Buttes Wilderness leads to Tannen Lake. This destination, however, cannot be comprehended apart from Bolan Lake, which lies outside the wilderness two-and-a-half miles to the north-northwest, with its odious no-host communal drive-in campground. 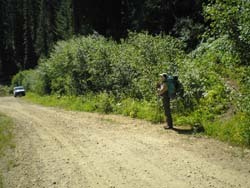 The Tannen Lake trailhead and Bolan Lake Campground are linked by seven miles of well-maintained, but winding Forest Service road and an outlaw culture of ignorance, noise, garbage, disrespect, and self-indulgent rapacity. At neither lake are wilderness ethics recognized or comprehended by the dullards who infest them. Barbara and I started the week innocently at our cabin east of Ashland, Oregon, taking it easy. Way easy. Easier than I can ever remember. Three weeks previously "seeds" of radioactive Palladium 103 had been rudely rammed into my nether regions to kill off prostate cancer cells, those unwelcome descendants of dread. Of us, yet other, cancer cells are adolescent stepchildren grown beyond reason and determined to break your heart. Tired, listless, astride an ever-burning coal which pressed against bowel and bladder in a vital place I had rarely contemplated, day by day I was losing traction with this world. This was not an ideal time to venture beyond the bathroom, the familiar, or the convenient. Yet I would attempt the wilderness, which might, I hoped, cleanse my body of impurity as it had for decades cleansed my soul. And perhaps it might have, but for the horror of the screaming children. We decided to take it one small step at a time. See how it went. We would try camping one night in the van at Bolan Lake, and, if all went well, attempt an overnight backpack the next day into Tannen Lake. The Bolan Lake Campground was already half-full when we arrived. Fishermen, their wives and yelling children, and their tents, campers, and pickup trucks clustered at the beach and gravel boat ramp at the north end of the lake. Out on one of the spiral arms, where the gravel road looped back toward the galactic center, we found a nice spot above the southeast shore, furnished with picnic table, tent site, and barbeque grill, comfortingly near an all-night pit toilet (N 42 01' 23.9", W 123 27' 31.8", 5394 feet). We considered ourselves sufficiently away from the main infestation. An isolated foot-trail left our camp and wound counterclockwise around the lake, out of earshot of the main campground. We followed it through verdant brush and a profusion of summer wildflowers tumbling down to the water's edge. The lake was lovely, viewed at a distance from the campground. Later that afternoon, as we set up our camp, the thump and whine of rock and roll music began to override the rustling silence. A DJ on amphetamines offered oldies but goodies. The noise grew louder. In the large double campsite in the center of the campground someone had opened both doors of a beat-up old felony Trans-Am and torqued up the volume of the stereo. Speakers in both doors were aimed right at us. I groused to Barbara, who advised me to try and ignore it. I tried, but the thudding and shrieking grated on my nerves. "Now I know why campgrounds have hosts," I grumbled. "I think I'll go on down and ask the guy to turn it down." Barbara didn't think that was a good idea. "I'll be diplomatic," I assured her. I took a wide meander through the main campground to evaluate the impact the music was having on others. Though especially loud at our campsite, the music intruded everywhere. I would take a poll. I started to approach an attractive young blond mother, but she was distracted chasing two toddlers, hollering, up a hill. At the next campsite sat an elderly gentleman in a folding chair. He wore a sea captain's cap and a thin moustache curled up at the ends. I asked him what he thought of the music. He rolled his eyes and shook his head, but obviously didn't want to get involved in a potentially homicidal confrontation. ". . . Now she gets her kicks in Stepney . . ."
"EXCUSE ME!" I yelled to a paunchy, barefoot man in shorts and a gray tee-shirt.
" . . . Not in Knightsbridge anymore . . ."
I called again, inching cautiously into his territory, before I caught his attention. ". . . So don't play with me . . ."
He looked as dilapidated as his car. Puffy and worn. Greasy hair hung in his face in tangles, and two incisors, one upper and one lower, were missing from his dull smile. ". . . Cause you're playin' with fire . . ."
As he approached, strong fumes of alcoholic beverage crashed over me. Behind him I noticed a similarly stocky, unkempt woman dangling a half-empty quart of whiskey from one arm. I braced myself and said, "Do you think you could turn the music down a little bit? We're camped up there," I pointed, "and it's pretty loud." He swayed for a moment trying to process what it was I wanted, then grinned. "Sure!" No problem. Glad to comply. He lurched into the front seat and the cacophony vanished. "Thanks a lot," I said sincerely. It had dawned on me that this man and woman possessed no sinister intent, but had been blissfully unaware of the impact they were having on those around them. Once they were enlightened, they did the Right Thing. Problem solved, I headed back to join Barbara at the van, rejoicing in the innate goodness of humanity. But we had made one fatal miscalculation. We were in a public campground on the cusp of Friday Night. Vehicles began arriving about dinnertime. From Cave Junction and Grants Pass they came, and from Happy Camp over the mountain on the Klamath River. This was their province. Their playground. Their familiar place to party and unwind from another tough week of drudge labor. Two more vehicles had joined the Trans Am, and the music was again cranked up. This time it was country and western. Johnny Cash bemoaned incarceration in Folsom Prison. Family and friends drank and staggered and danced and swayed and laughed around a roaring bonfire. Tribal. Savage. Loud. Barbara and I resigned ourselves to the fact that we were the interlopers, the foreigners, the strangers with strange expectations. Comforted by the anticipation that we would hike into the wilderness the next day, beyond the reach of motor vehicles and madness, we made preparations for a noisy night. Mercifully, the revelers turned their music down when darkness fell. Perhaps they had all passed out. Saturday morning the campground was peaceful. A few early risers, like us, sat silently around their campfires. The lake lay calm and still in the silver light. After breakfast, we stuffed our backpacks and packed up the van. I was feeling good to go for an overnight excursion. The short drive to the Tannen Lake trailhead should have been easy. Forest Service Road 041 would have brought us there in less than twenty minutes, had we not missed a sharp left turn just before Kings Saddle. Instead, we continued straight ahead on well-graded FS Road 19N01. No signs announced the road change. After descending a couple of miles into the Klamath Valley we came to a sign marking the southern terminus of the Boundary Trail. This trailhead seemed to be in the wrong place. The previous year we had hiked the upper segment of the Boundary Trail to its northern terminus at Windy Gap, sixteen miles away (See A Campsite Lost and Found). We stopped to study the map and realized our wrong turn. The Boundary Trail was indeed another, longer approach to Tannen Lake, but there was no place to pull the van off the narrow roadway. Besides, considering my recent surgery, I had signed on for a half-mile excursion, not a three-miler. So we turned back and found where Road 041 cut over the shoulder of the ridge, arriving shortly at a wide place at the end of the dusty spur road. Another vehicle was already parked. Unsigned, the Tannen Lake trail was a little tricky to locate about 100 yards back up the road where it slashed into the underbrush and up the overgrown bank. From the top of the slope, before the trail cut into the gentle green valley that harbors Tannen Lake, we observed a beat-up Trans Am pulling off on the side of the road far below. It looked oddly familiar. Our little excursion barely pricked a western bulge of the Red Buttes Wilderness, which drapes over the high and craggy Siskiyou Mountain Crest like a prayer flag, fluttering partly in California and partly in Oregon. The Siskiyou divide separates the headwaters of the Illinois and Applegate Rivers, which feed the Rogue River to the north, from the Klamath River drainage to the south. 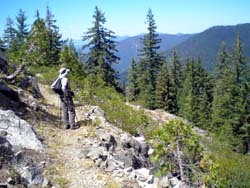 The Pacific Crest Trail ascends the steep forested valley wall from the Klamath toward the twin ultramafic peaks for which the wilderness is named, then doglegs eastward just shy of the wilderness boundary to follow the crest bound for Mount Ashland. Our hike was over almost as soon as it began. We did not even break a sweat. 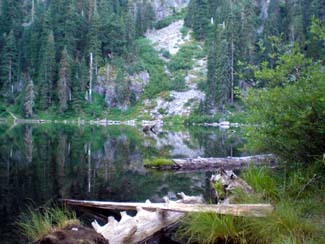 The trail leveled out through a brushy meadow and arrived at the north end of the lake, near the outlet stream, where twin giant Douglas firs towered over a rare patch of flat, open earth hosting a rock fire ring. Beyond the twin towers lay a small, grassy beach, interlaced with the gray-white skeletons of fallen trees. We off-loaded our backpacks to claim the campsite (N 42 00' 33.7", W 123 27' 52.5", 5061 feet). 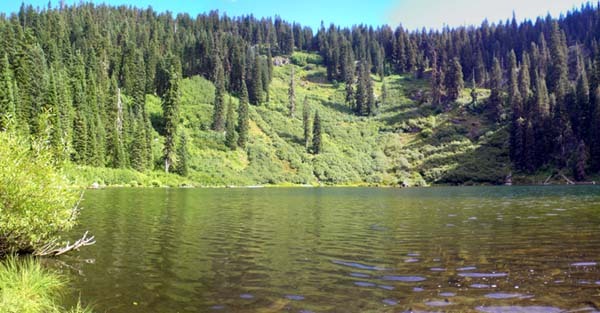 Tannen Lake sits in a glacial cirque wooded and brushy down to its shore, a small blue-green gem in a verdant setting. 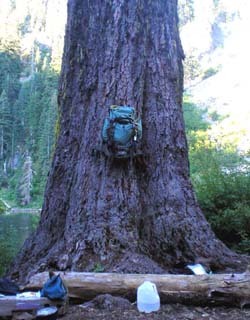 The guidebooks say that this area of the Siskiyous is one of the most biologically diverse in the world. Lush. Overgrown. Rare species of conifer are said to adorn these woods, although their subtle differences were beyond our poor powers to resolve. We left our packs and followed the fishing trail along the south shore in search of a more secluded campsite. Large incense cedars and white fir grew abundantly from a rich and varied ground cover of rhododendron, scrub oak, wildflowers, berries, and ferns. Willows and alders choked the shoreline, making it difficult to access the water. At the southwest corner we found another campsite, but it was primitive, overgrown, and long abandoned, with difficult access to the shallow water. On our way back to our chosen campsite, we met two fishermen with long poles over their shoulders. "D'ya know where the trail to East Tannen is?" asked one of them. He was the Trans Am guy with the missing incisors whose music had so irritated us at Bolan Lake. His face was ruddy from the short uphill hike. In this wilderness setting, without the booze, he looked younger and healthier than when we spoke the previous day. His companion was a teenage boy. Perhaps a nephew or an in-law. "Sorry," I said, shaking my head. I had not yet studied our map. "I think its over that way someplace." I waved across the lake to the northeast. We watched them continue south along the trail before disappearing into the brush. Small world, I thought. I really had no idea how small it would become. We popped up the tent and threw in our pads and sleeping bags. I rearranged some rocks in the fire pit to accommodate our grill while Barbara hung a few things from nails in the trees and gathered firewood. Then we sat on a log by the water and watched the fishermen fish the southeast shore far across from us. "Do you feel like hiking over to East Tannen?" I asked. "How far is it?" Barbara wanted to know. "Round trip? Couple of miles. Tops." "How are you feeling?" Her eyes wore concern. "I feel okay. I think I can make it. We don't have to go the whole way if it gets tough." We zipped up the rainfly and set out pots and bottles to make it clear this campsite was occupied. I strapped on the camera. We easily crossed the brush-choked outlet stream on broad rocks and followed a trail northeast into the forest. The shade of the tall Douglas, red, and white firs smothered out the thick underbrush. Soon we circled eastward up out of open forest onto the exposed metasedimentary rock of a north-facing leg that overlooked the Illinois River Valley. From there we could see the central bulk of the north-south trending Siskiyou ridge, which the Boundary Trail traced to granitic Grayback Mountain. Our trail soon looped back southeast and climbed a fern- and brush-filled meadow into another glacial cirque like that of Tannen Lake. East Tannen Lake was a smaller version of Tannen Lake, even more brush-choked and shallow than its companion. We had to climb over fallen logs to reach the shore, which accommodated one miserable little fire ring, abandoned and overgrown. Another massive fallen tree had plunged into the lake, blocking access to the water. The cirque walls here were steeper, with more exposed rock than at our lake, making it more intimate, but it would have been difficult to scratch out a clearing for a level tent site. We were glad to have seen it, but did not tarry long. One the way back, we met some elderly day-hikers, who wanted to know where the hell East Tannen Lake was. "Not much further," we encouraged them. We heard the screaming children long before we could see our lake. Their shrieks pierced the gentle forest like needles. As we came into view of the lake, I scanned the shore to see how close they were to our camp, but saw nothing. The screaming grew louder as we climbed from the brushy stream crossing into our campsite. The young blond woman I had seen chasing children at Bolan Lake came up from the lake between the twin firs. She was in her early twenties, with a pretty face and blond hair, but stomach and thighs bulging a bit too much for the bikini she wore, her youthful beauty sinking into a swamp of adipose. "Hi'ya," she greeted us. "Pretty place, i'n'it?" "We're spending the night," Barbara explained, gesturing unnecessarily to our tent and backpacks leaning against the trees. "Oh," she said, astonished. "What about the bears?" "Bears?" Barbara was taken aback. "What bears?" "Oh, I'm just afraid a' bears in the woods. D'ya have a gun?" No, we did not have a gun, Barbara replied, wondering at the extent of the arsenal in their truck and maybe concealed among their clothes haphazardly strewn around our camp. "Ain'cha afraid?" she asked, wide-eyed. "Do you come here often?" Barbara asked. A child let out an unnerving scream that set my teeth on edge. The woman seemed not to hear it. "Yeah. Sure do. Twenty-eight miles from Cave Junction. Better'n drivin' up t'Grants Pass." Unheeded, the mindless screaming persisted, and a naked two-year-old trailed into our camp. For the first time that day I was beginning to feel unwell. I eased myself down on a log beside the fire ring. "That's my husband." She pointed to a slender blond fellow fishing off a tree that had fallen into the water. He looked barely out of his teens. The woman herded the child back down to the beach, where she and a younger infant splashed and squealed in the mud and water. The man fished like he was alone and had all day to catch something. I could not get comfortable. I felt trapped like a rat in some sleazy terminal waiting room, forced to watch a soap opera on a television with the volume turned up way too loud. Time dragged on. This was not the communal drive-in campground at Bolan Lake. This was Tannen Lake. Within the sacred boundaries of the wilderness! Where hikers are supposed to respect each other's privacy. Where campers leave each other distance. Where everyone reveres peace and quiet. At Barbara's suggestion, we took a walk, gathered some firewood, and returned. The man had inflated an air mattress and was paddling out on the lake, making a grand sweeping tour of the entire shore. Forty-five minutes grew to ninety. "D'ya have t'poop, baby?" I could hear the woman talking to the little girl just beyond a willow hedge. "Can y'poop in the water?" In the water? Surely I misheard. That's our drinking water. But I said nothing. Did nothing. Only endured with plummeting blood sugar, waiting for them to go away. Still they splashed and whooped on our doorstep. The older child kept returning to show us one thing or another. We did our best to ignore him. That only made him more persistent. I turned my back. He padded around in front of me. "I don't want to see it," I finally barked, a little louder than I intended. And perhaps with an edge of hostility. Maybe even, to his mother's sensitive palate, with just a soupcon of infanticide. The blond woman hurried in and scooped him up, perceiving for the first time that we might not be all that friendly. The festive mood had changed. She and her husband hastily began packing up their belongings, which was not a trivial task. Barbara and I sat silently and endured. Our parting was not uncordial, but we were thrilled to see them carry their children through the meadow and disappear into the brush. At long last, we had the campsite to ourselves. Dinner buoyed our spirits. That evening we sat in the grass on our foam pads at the edge of the lake, leaning against a log, and for the first time began to feel a full measure of peace. That night was a little rough for me, but I learned the skill of digging holes in the duff by flashlight. Something to add to my resume. Sunday morning I was feeling fine again as we sat beside the morning fire, watching the sunlight silver the still lake. Pondering the arc of circumstances, I wanted to attribute my misanthropy not entirely to events, but to my mood, to my illness, to my convalescence. The myriad perceived offenses were nothing but figments. It was all in my mind. Then an ember spat from the fire and burned a quarter-inch hole in my pant leg.